It was my first night on Japan’s Hachijo Island, and a typhoon was growing outside, shaking the guest house. The many geckos that lived in the house made hurried shuffling noises, and took cover behind every picture and scroll — I wondered what they knew that I didn’t. I’d never been at the center of a typhoon before but my host didn’t seem worried as we shared a cup of tea. I mentioned that I was on my way to the next island over and she told me that none of her guests had ever made it there. For now, I was on Hachijo, one of several small volcanic islands south of Tokyo, known as the Izu Islands, created by the collision of the Pacific and Philippine Sea Plates. I love that the world is made of tectonic plates, sliding and colliding, ever changing, creating volcanoes and earthquakes. Some people want to visit every continent. My goal is to visit every major plate, to touch all the earth’s puzzle pieces. So far I’ve made it to ten of the thirteen on my list. Setting foot on Hachijo allowed me to touch the Philippine Sea Plate. During Japan’s Edo period Hachijo was used as a prison because it was so remote. One of its most famous prisoners, Ukita Hideie, was exiled here in 1606 after loosing a battle to the Tokugawas. The Tokugawa shoguns went on to rule Japan from 1600 to 1868. There’s a story that Ukita, no longer allowed his swords, took up taiko drum sticks instead and spent his days drumming to express his longing for home. The taiko drumming group Ondekoza has a moving song based on that story. The beauty of that song is one of the reasons that brought me here. The typhoon winds and pulsing rain kept me awake most of the night. The next morning, the skies were calm, the geckos happily roamed the house, and I hopped on my bicycle to find Ukita’s grave. It was a misty day as I passed black lava beaches with waves still huge from the storm and a botanic garden displaying some bioluminescent mushrooms native to the island. The roads were littered with hundreds of iridescent beetles, lying dead, killed by the storm or some biological imperative. Around the island were several abandoned grand hotels. 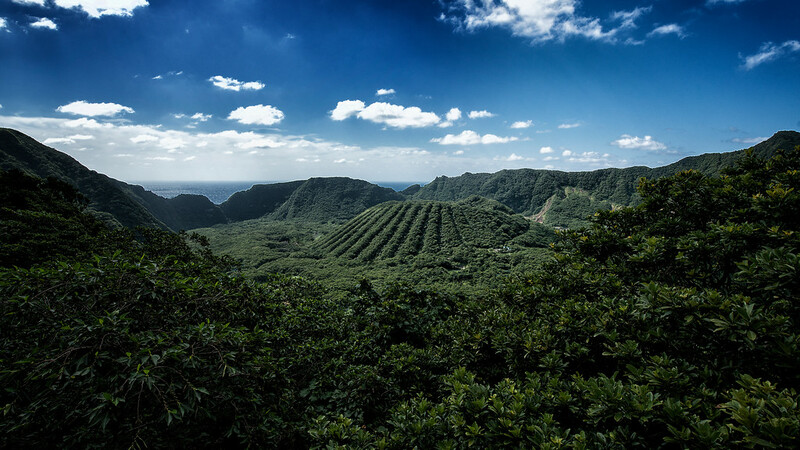 In the ‘60s, the government promoted the island as the “Hawaii of Japan,” but I guess it didn’t work out. 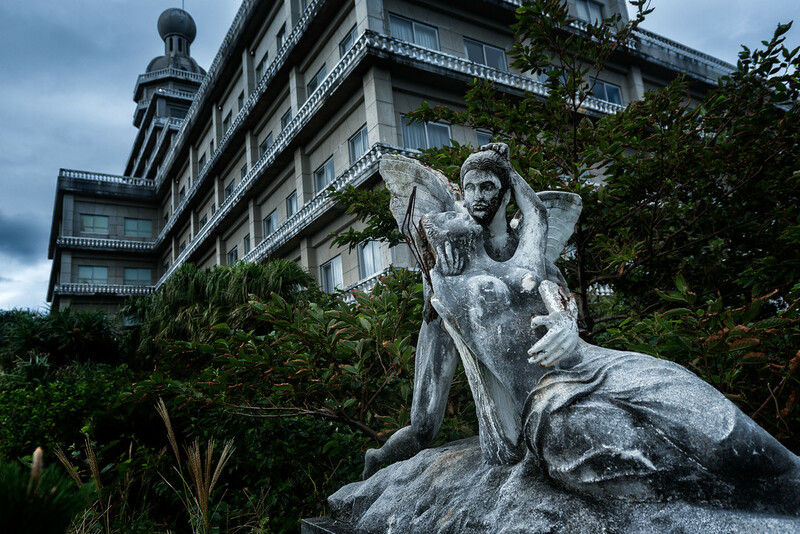 Passing the aging Hachijo Royal Hotel, I couldn’t resist sneaking in. I passed a statue of a pair of lovers crumbling under the weight of time. Around the back were locked glass doors protecting a huge mound of food jars and beer cans, as if a ghost had been partying here for a hundred years. 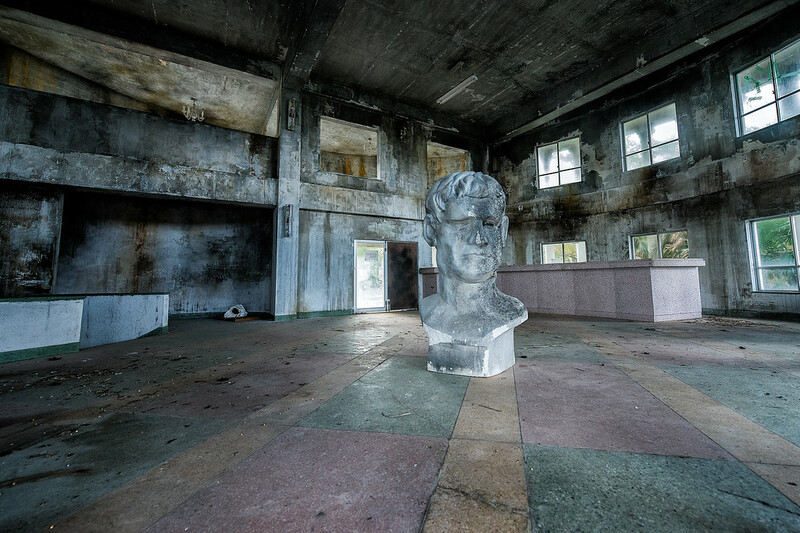 A heavy rain was starting to fall as I climbed through a broken window in the back building and found a large, round room with nothing in it but a gigantic sculpted head sitting in the middle, a guardian, staring at me. There was an overwhelming sense of mold and sadness and I felt increasingly uncomfortable, like I’d violated some spirit boundary. I rushed out, past the giant head, the mound of cans, the eternal lovers, and back to the entrance where the police were waiting for me. They looked a bit annoyed. I don’t think it’s very Japanese to sneak in to abandoned buildings. On the other hand they seemed grateful that they didn’t have to go inside to find me. They politely told me I shouldn’t be in there. I agreed completely and left immediately. 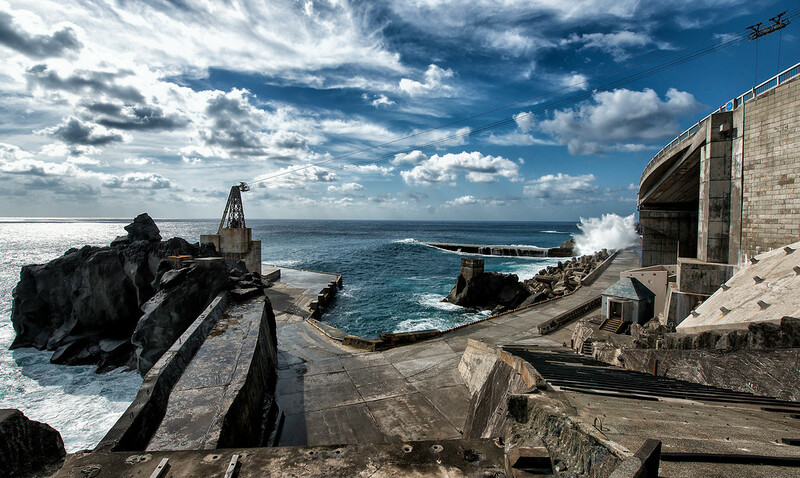 Aogashima. It’s one of those places you come across when you’re sitting at work, dreaming of travel, and searching the web for exotic sites you know you’ll probably never visit —a small remote island, the tip of a volcano peeking out of the sea, about 3km across, with a population under two hundred. There are two ways to get there from Hachijo. The first is by supply boat, which wasn’t running at the time due to the rough waters from the typhoon. The second is by a daily helicopter that takes nine people. The helicopter office at the airport seemed to be always closed and their Japanese website was incomprehensible to me, so I began to understand why no guest had made it there. But I wasn’t going to give up. Later, with my host’s help, at the lovely Galaxy Guest House, we were able to puzzle though reserving a seat for the next day. I thought I might actually make it there. But then I couldn’t find any way to book a room on Aogashima; it’s like they didn’t exist. The next morning, out of stubbornness and faith, with no room booked, carrying just a small day bag, I boarded the helicopter. It was a beautiful sunny day as we crossed the sea and watched Aogashima slowly grow out of the horizon. I’m pretty sure I was the only tourist on the helicopter; the other passengers looked like wives and children returning home with shopping bags from Tokyo. 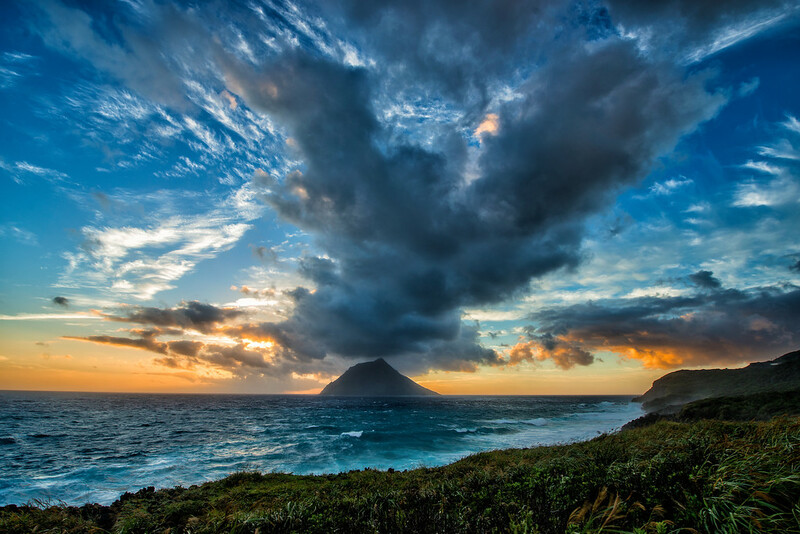 The island is made of sheer volcanic cliffs on all sides that go down to the sea, with a bowl shaped depression, known as a caldera, in the middle. 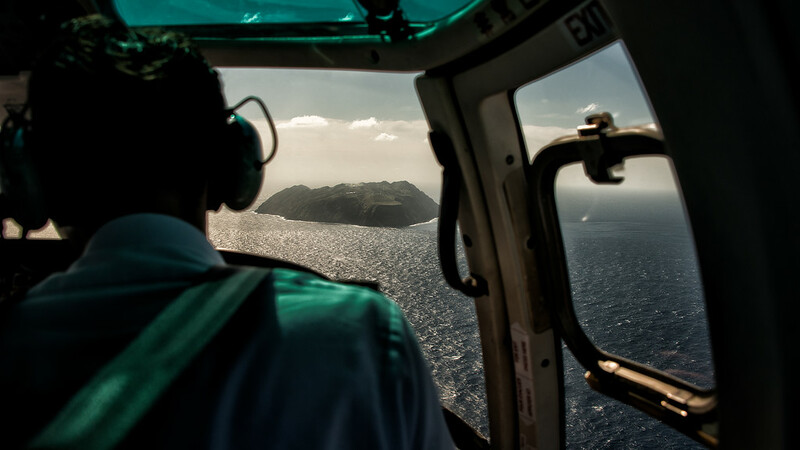 The helicopter dropped us off at a small heliport on a flat spot of land on the outer edge of the volcano, along the sea. After the complications and storms, I’d landed — I’d made it! As soon as the helicopter left and the passengers disappeared, I realized I was in a small village with no people around, no guest houses, and no grocery. I was in a place for farmers, not tourists. Now I know why I couldn’t find a room. I was in trouble: no room and no food. I followed a road that made its way up the cliffs. The island only has a couple roads, so the choice was easy. After about an hour I saw a gang of professional looking, sweaty, men in white uniforms, up on ladders repairing power lines, they were the first people I’d seen, and I was grateful I wasn’t alone. I must have seemed out of place to them, probably the only white guy on the island in a while, just strolling down the middle of the road. To be honest, they seemed out of place too, like strangers that roamed the Izu Islands taking care of any and all maintenance. My dreams of seeing the rest of the island quickly faded as I imagined being locked up for the night. But then he smiled, made some calls, and found me a place to stay! We got in his car and headed back to the main village near the helipad. We stopped at a guest house, with no sign out front, and the kind motherly woman who lived there said I could have a room and meal for me the night. I was disappointed that I’d have to start my walk again, but to my surprise, he drove me back to where he found me so I could continue exploring! We’re still friends on Facebook. I was set, my traveler’s faith had won out again. 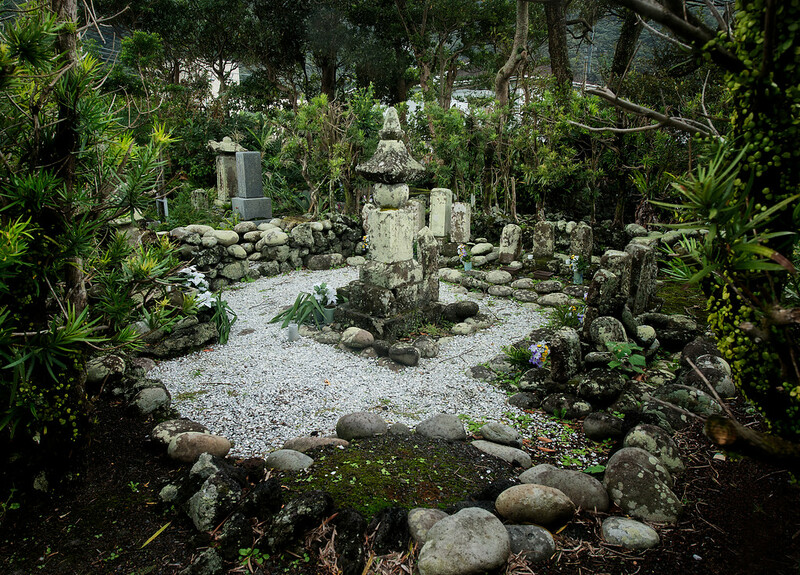 A rocky jungle path led to the top of the cone where I found an overgrown wooden shrine. I think it was for the roughly 130 people killed when the island erupted in 1785, or perhaps it was an offering to keep the volcano happy. It’s risky living at the collision point of tectonic plates. I was starting to feel dizzy from the heat and humidity. It had been hours since I landed and I still hadn’t found food or water. The road around the island continued through a tunnel to the sea side of the cliffs. I came across an empty harbor that felt like something staged, waiting just for me, like a puzzle in a video game. There were odd pulley lines running overhead, and I imagined that if I found a missing gear and turned the right lever that a crate full of treasure would slowly swing in to view. 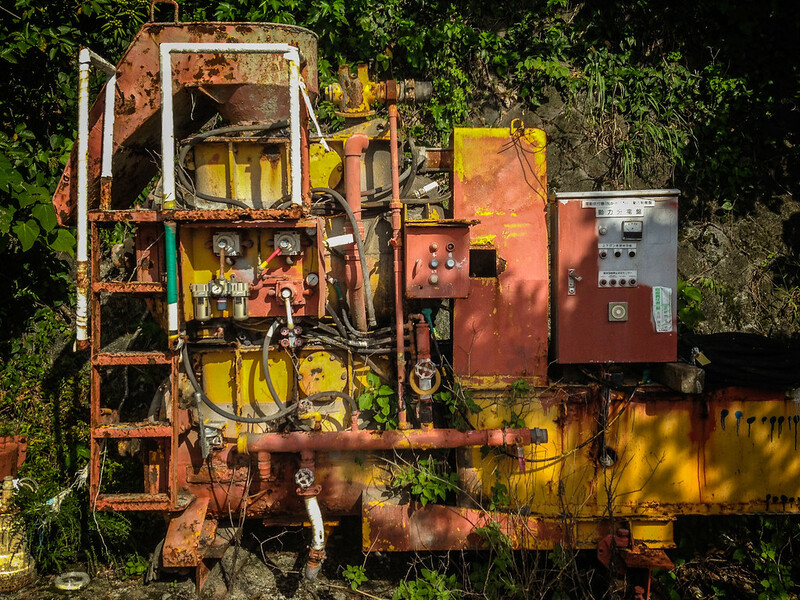 Hidden along the road I found an aging complex machine of some unknown purpose. l’m sure if I turned the handles in the right sequence it would have given me a clue or opened a secret passage in a wall. I came to a sudden stop at a construction barricade where the road had slid down the cliff. I jumped the barricade but, after a long debate with my stubborn side, decided I didn’t want to slide down in to the sea. I turned around, doubling my walking distance right when I thought I was about done. On the way back I discovered an onsen, a thermal spa using the heat of this, active, volcano. I’m not sure how I missed it the first time around but I was thrilled when I found its vending machine, and grabbed a couple bottles of cold water for my walk to the guest house. I was amused to see the construction workers were also staying at my guest house. Maybe it was the only guest house on the island? Maybe it was just someone’s home? The workers were dressed casually, smoking, and very relaxed and talkative. We shared a group dinner of fish and vegetables while sitting on the floor around a large table. The construction boss kept offering me beer and octopus, and I had the hardest time explaining I was vegetarian. We all drank and ate a lot, like men who’d been working all day. We laughed all through dinner and didn’t understand a thing the other was saying. The next morning, I headed back to the helipad. Everyone I’d met turned up to wave goodbye: the construction workers, the woman running the guest house, and even the policeman. I said goodbye to Aogashima and to people I didn’t quite understand but enjoyed and consider friends. The logistics of this trip where the hardest I’d ever faced, but my traveler’s faith bailed me out again and again, and what mattered was not the trouble, but that I’d made it from dreaming at my work desk to exploring this magical place. I don’t think I solved the mystery of the island but I’m happy I made it there. It’s great to read a travel story which is very off the beaten track, well done in getting to the grail of Aogashima. The shot of the island of the crater within the crater is amazing. And Facebook – you gotta love when I hear stories like your policeman one. Safe travels. Do they grow something there ? There were several farms but I’m not sure what they were growing. I think they have a power plant and water station too, but they also depend a lot on the supply ship, for gas for example. I’m hearing conflicting info that on one hand Japan is outrageously expensive and on the other hand cheap. An amazing story. I felt like I was there with you – especially in that abandoned hotel – brrrrrrr. I’d have been out in a hurry too. You had a dream and followed through. It always works. I know what you mean about traveller’s faith. It always blows me away how perfectly things work out, even if they can look a bit problematic for a time. The more I travel the more I trust. People are good. Incredible pictures, I absolutely love abandoned places like the hotel in your post. There seem to be so many of them in Japan once you get off the beaten track. Thanks for sharing their beauty with us. Thank you for the nice words. 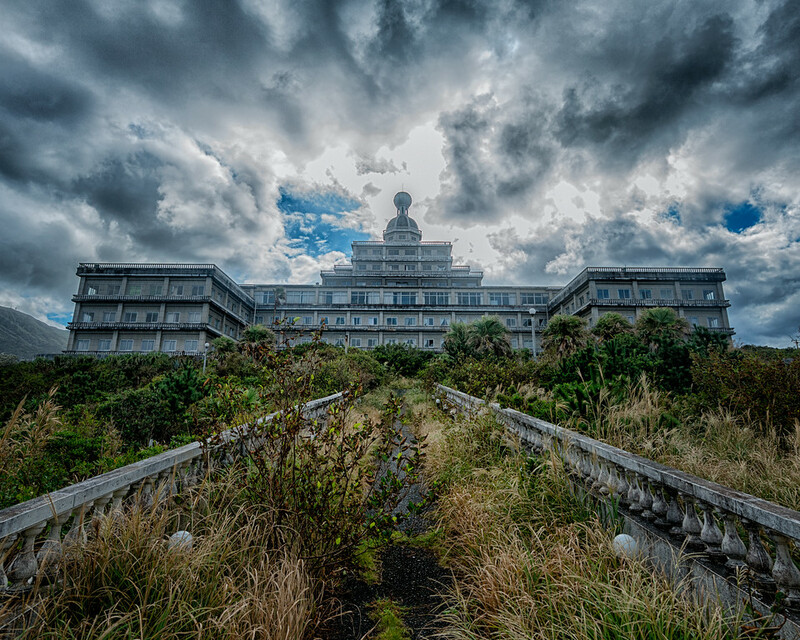 It would be so much fun to go explore Japan’s abandoned places! 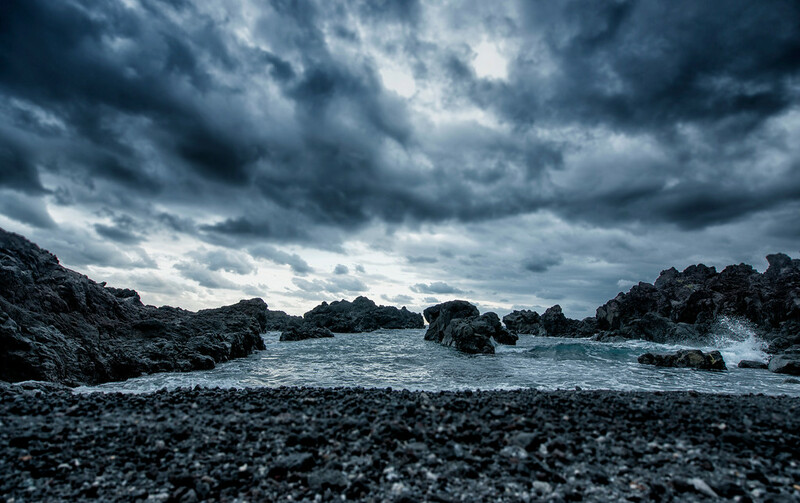 The black lava beach photo brought me to my knees. OMG – it’s stunning! I felt a profound sadness as I read your words. Your writing is as masterfully composed as your photographs. You encourage and inspire me. Thank you. Wow, thank you! Your encouragement means a lot to me. It’s a lot of work, so it’s nice to know I’m on the right track. Best wishes. Wow. I am traveling to Japan next year and will be saving this post for sure to look at it for future reference. These places look amazing!!! You’re most welcome! Do pop by LadyRedot.com when you have the time! Have an awesome week! I just stumbled on your blog today. What a treat! You have a wonderful story telling nature to your writing and I LOVE that you take the time to create that sense of atmosphere, that sense of place. Too often travel blogs seem to be curt travel logs… “went here, did this, saw that….” Yours is so much more. And your photos are tremendously atmospheric, vivid… spectacular. Thanks for the treat! I’ve just entered the blogging world and have found inspiration here. Thank you! Brilliant, hooked after the first sentence! Really interesting story and fascinating to hear about a proper off the beaten track place! Thank you! Thanks Tom. That’s great to hear. These are beautiful pictures. 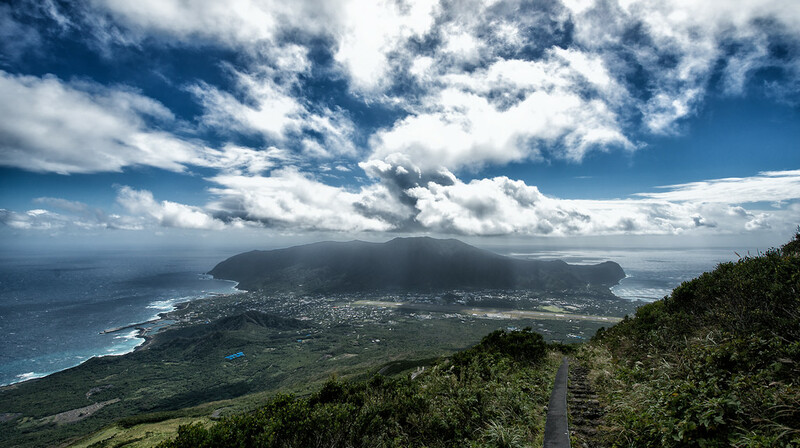 I’ve never heard of Hachijo, but your photos make me want to go explore it! Thanks for the comment. Hachijo was a fun side trip from Tokyo, after I’d hit the big spots in Japan. They wouldn’t let me rent a car there, I’m not sure why, so I got around by bike, which was hard work. It’s a big island and I felt I missed some fun waterfalls and other spots. The loop around the island is about 40km. I guess what I’m saying is if you go, you might want to check ahead about getting a car.